I thought I had thought of everything for my daughter’s multi-national birthday party. 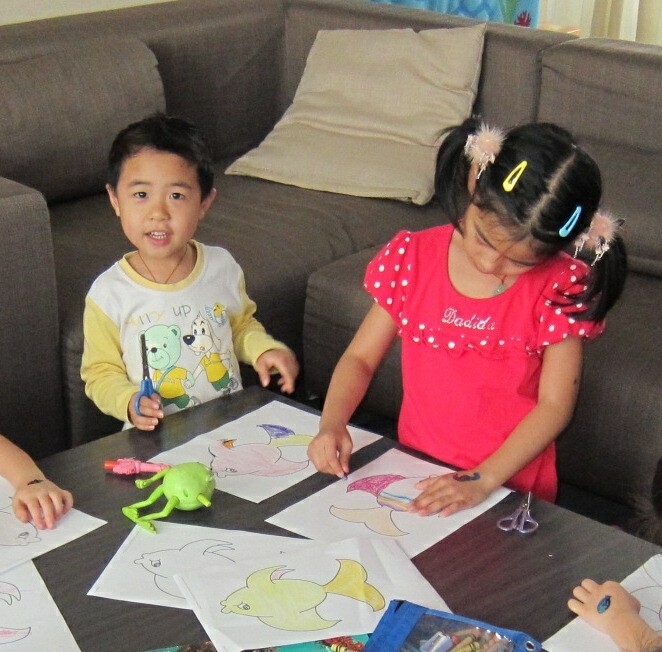 We invited some friends from Western countries, and we invited some Chinese friends from her preschool class. I knew I’d need to accommodate both groups’ standard arrival time, which would be significantly different, even if they were both told the party would start at 3:00 p.m. The Westerners, I assumed, would arrive right at the party’s designated start time or maybe a few minutes afterwards. The the Chinese friends, on the other hand, wouldn’t get there until 3:30 or even later. Because of that gap, I needed something to kill that cross-cultural down time for the party guests who would get there first. I planned an easy craft, and we were all set. So smart, so smug. So wrong. I was quite surprised to have our apartment intercom buzz a few minutes before 3:00. What? Not even Americans come early to a party. I was even more surprised to discover that the earlybirds were the Chinese friends. All of them. At once. One big group dumping kids en masse into our apartment. I was confused, but of course still welcomed them and had the kids start the erstwhile Western kid time-killer craft. To complete the irony, the Western friends didn’t start trickling in until around 3:30. Figures. It turns out that two things happened to create this comedy of errors. 1) The Westerners we invited had all lived in China for a while, and were used to “China time.” So, they showed up a little late, China style. 2) The Chinese families, on the other hand, had been sternly warned by the preschool teacher that when Westerners say 3:00, they mean 3:00, and they had best do all in their power to be punctual, Western style. Amy Young calls this “bending towards each other,” the first of seven stops on her “Cross-Cultural Clash Continuum.” Each party is trying their best to play by the rules of the other party’s culture, but because of that, they miss each other. It’s kind of like The Gift of the Magi: Cross-Culture Edition. In the above example, I was caught in the cross-fire of the two groups bending towards each other, but there are plenty of times I’m one of the ones bending. I serve fruit for dessert for my Chinese friends, following what’s normal in China, but the guests were actually hoping to try one of the famous American desserts they’ve heard so much about. I politely nod my head when meeting a new Chinese colleague, hands plastered to my sides as she awkwardly sticks out her hand because she’s been told that Americans shake hands. I urge my Korean friend to be first in the buffet line because he’s the eldest in the room, but it turns out he’s already instructed his kids to go through first because that’s how Westerners do group potlucks. Or, because I’m dealing with another bi-cultural person, I hesitate and wonder which culture’s rules we’ll be following. At my Chinese-American friend’s house in the U.S., do I take off shoes or not? When I offer my Malaysian friend some coffee and she declines, do I assume she means it, or offer two more times before giving up? With other friends who have lived in my culture, or are familiar with American ways, is it okay to split the bill? Give a hug? Laugh my natural, obnoxious, LOUD American laugh without covering my mouth? It’s interesting that it’s sometimes easier to navigate these interactions with a farmer in Podunkville, China (not a real place, FYI) who has never heard that Americans consider it rude to make so much noise while eating. He won’t make any attempt to change his behavior; it’s all on me to bend to his culture. And in that case, all goes well. The awkwardness comes when it’s someone who knows something of my culture’s rules, and bends to accommodate me, right as I’m bending to accommodate him. It’s like the dance you do on the sidewalk with an oncoming pedestrian when you both first go the same way to make room for the other, then both go the other (same) way. Usually, you figure it out and pass successfully, but that doesn’t always happen with culture. Some days, we manage to get it right, and some days, I just laugh to myself and give the crafts to the Chinese kids. Top 10 things I get overly excited about when in the U.S. Hilarious! The “dance on the sidewalk” – such a good description of what is happening with the “bending”. Excellent. So, are you celebrating your kids’ lunar birthdays as well? Emily I love the title! This is it exactly :). And I love the tension of people who are bi-cultural interacting. I can see myself in so many of your examples :). I’ve been the one late to a party because I thought others would be … or was I on time? :)!! I think you were exactly on time. 😉 Really glad you liked this!